A staple of Gothic Rock compilations and a band responsible for more than few unforgettable tracks in the 1980s, The Danse Society have experienced enough twists and turns in their 35-year career to keep fans – including this music writer – busy and confused as they try to piece together a coherent narrative on how Reincarnated came into being. After releasing a series of albums including 1983's stellar Heaven Is Waiting, The Dance Society (powered by the charismatic voice and gender-blurring good looks of singer Steve Rawlings) ground to a halt in 1987. Fast-forward 22 years, and original members Paul Gilmartin (drums) and Paul Nash (guitar) get inspired to bring the back back. Bringing in keyboardist Dave Whitaker (who originally played in the band towards the end of their '80s run), they briefly reunited with Rawlings before recruiting Italian singer Louisa “Maethelyiah” Pile. This version of The Danse Society released two well-received albums (2011's Change Of Skin and 2013's Scarey Tales) before Gilmartin abruptly left the band in 2014 under acrimonious circumstances. With Whitaker soon joining him, Gilmartin assembled a new Danse Society with singer Brian O'Shaughnessy, bassist Ade Clark, keyboardist Darren Guy and guitarist Elliot Wheeler. 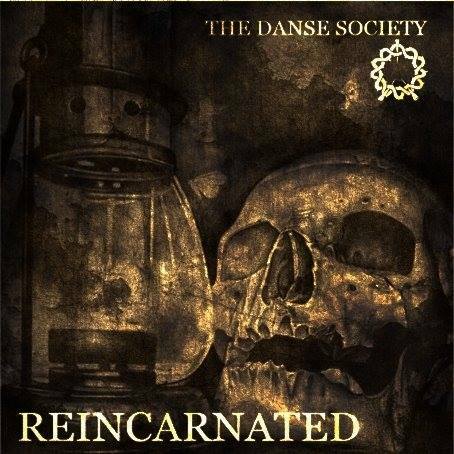 In October, this version of The Danse Society unveiled Reincarnated, a collection of newly written material and re-recorded classics. First off, let's address the all-important frontperson issue. Gilmartin has done the completely unexpected and enlisted a straight-out Rocker in O'Shaughnessy, best known for his work with Oliver Dawson Saxon and New Wave of British Heavy Metal (NWOBHM) stalwarts Seventh Son. Certainly more Ian Astbury than Ian Curtis, O'Shaughnessy brings a decidedly hard edge to Reincarnated, turning Gilmartin's Danse Society into something more akin to the Hard Rock leanings of Craved In Sand-era Mission than the Siouxsie And The Banshees vibe achieved by the Maethelyiah-fronted group on their previous two albums. New guitarist Wheeler is another brilliant addition to the unit, bringing in truly inventive playing and songwriting skills that meet (and very often succeed) the standards set by the original '80 band. In addition to bringing in an unlikely frontman and a powerful new six-stringer, Gilmartin (who now steers the ship solo following Whitaker's recent departure to focus on studio work) has the audacity to begin Reincarnated with “Message In The Wind” - the exact same song that opened Scarey Tales just two years ago. It's a ballsy move, but the risk pays off because Gilmartin and Co. don't merely reenact “Message In The Wind” and the five original-era tracks included on Reincarnated – they completely reinvent them. The brightest moments of the re-recorded material include the new band's take on the 1983 track “Belief” (which is so drastically different from the original that it's almost an entirely new song) and the Heaven Is Waiting tune “Red Light,” which is given new life here thanks to Gilmartin's additional percussive flair and a particularly strong performance by Wheeler. One quibble: The new track “All That Shines” unnecessarily utilizes the same drum pattern as 1983's “Come Inside” (already included in re-recorded form on Reincarnated) even though the simpler beat on the fantastic demo version of the number would have served just fine. Reincarnated ends with the magnificent “Towers,” a track recorded circa 2010 during the brief reunion with Steve Rawlings. Bolstered by the original frontman's presence, the track is as close to the classic Danse Society sound as either current incarnation of the band will get at this point. Those with a careful ear will pick up on the fact that the music on “Towers” was also used for the title track of 2011's Change Of Skin. It works better here. While it remains to be seen what will ultimately come from the moniker tug-of-war between the Gilmartin and Nash camps, Reincarnated stands on its own merits as an album that not only lives up to the Danse Society legacy, but also points to an intriguing future for this formidable combination of musicians.